Using advanced fermentation technology, industrial biotech startup Manus Bio hopes to make manufacturing flavors, fragrances, and other products greener and more cost-effective—and maybe create new products in the process. The MIT spinout has created a low-cost process for engineering microbes with complex metabolic pathways borrowed from plants, which can produce an array of rare and expensive ingredients used to manufacture noncaloric beverages, perfumes, toothpastes, detergents, pesticides, and even therapeutics, among other products. Moreover, the reprogrammed microbes allow for more control in identifying and extracting compounds along the metabolic pathway, which could lead to discoveries of new compound ingredients. Most recently, Manus has recreated a natural plant process in microbes to cheaply produce mass quantities of a coveted stevia plant compound for a zero-calorie sweetener, called Rebaudioside M (Reb M), that's noted for being much sweeter than today's commercial alternatives. 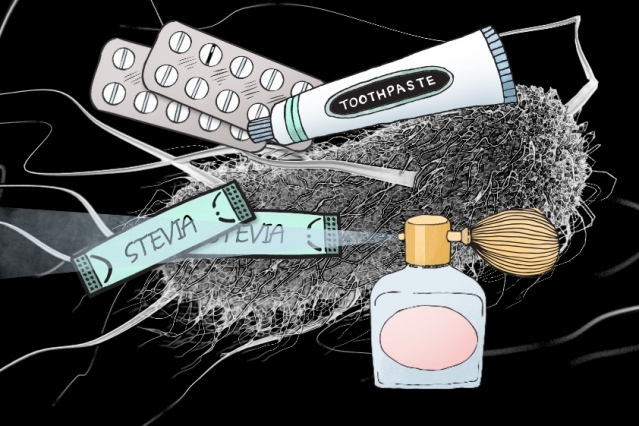 In nature, only .01 percent of the compound can be extracted from the stevia plant, so companies extract a more abundant but more bitter compound. Manus, on the other hand, has engineered bacteria to mimic the stevia plant's metabolic pathway. When put through the startup's fermentation process, the bacteria produced the compound at greater than 95 percent purity. Production of the new sweetener demonstrates how Manus' microbial engineering can be used to make more refined flavors and other products more cost effectively, says MIT professor Gregory Stephanopoulos, who co-founded the startup and co-invented the core technology with former postdoc and current Manus CEO Ajikumar Parayil. On average, Manus' process is about one-tenth the cost of any plant-extraction method and significantly reduces use of land resources.